GE Renewable Energy is currently preparing the site in Maasvlakte, the Netherlands, for installation of its Haliade-X 12MW wind turbine prototype. Preparations of the site which will host the world’s most powerful offshore wind turbine are being carried out in partnership with Future Wind. The two companies signed an agreement at the beginning of the year under which the first Haliade-X 12 MW wind turbine prototype is to be installed in Maasvlakte-Rotterdam this summer, with five years of testing and a 15-year full-service O&M agreement. 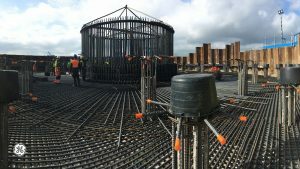 First activities on the ground started earlier this year with the construction of the Haliade-X 12MW foundation, which will contain 50 piles that will be covered by a 28m long foundation plate. Foundation preparation will continue until the arrival of the nacelle, blades and tower prototype parts later in the summer. All components will be shipped to Rotterdam, where pre-assembly work and installation will take place.